Dahlhausen Umbilical Cord Clamps are supplied in sterile, individually wrapped packaging. Dahlhausen Umbilical Cord Clamps feature a special gated hinge design to help ensure that the cord is correctly placed within the clamp. The lockable latch ensures that the clamp is fastened securely and creates a tight seal. Dahlhausen Umbilical Cord Clamps are manufactured in Europe and are CE Marked Medical Device. Dalhausen Umbilical Cord Clamps are already being used in NHS by maternity healthcare professionals. 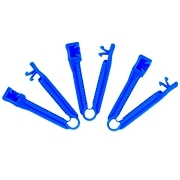 They are supplied in cost-effective pack sizes of 100 clamps. Dahlhausen Umbilical Cord Clamps are suitable for both medical and veterinarian use.